We will be organizing seminars, exhibits and will join local and international art shows and exhibits. Communicating Science and Art with Media @ The Union League Club of Chicago, April 18, 2019, Thursday, starting at 11:30 am. 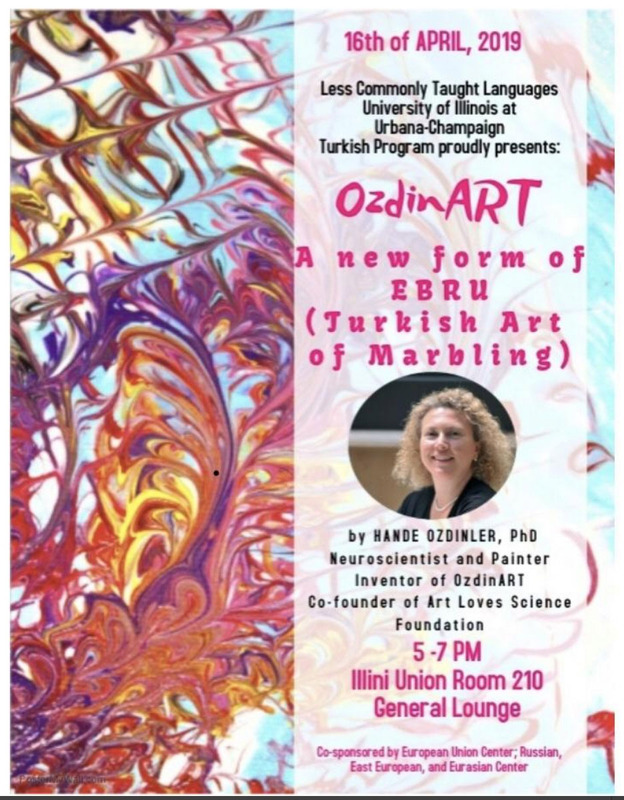 OzdinArt: a new form of Ebru (Turkish Art of Marbling) @ Illini Union Room 210 General Lounge, April 16, 2019, Tuesday 5:00pm - 7:00pm. 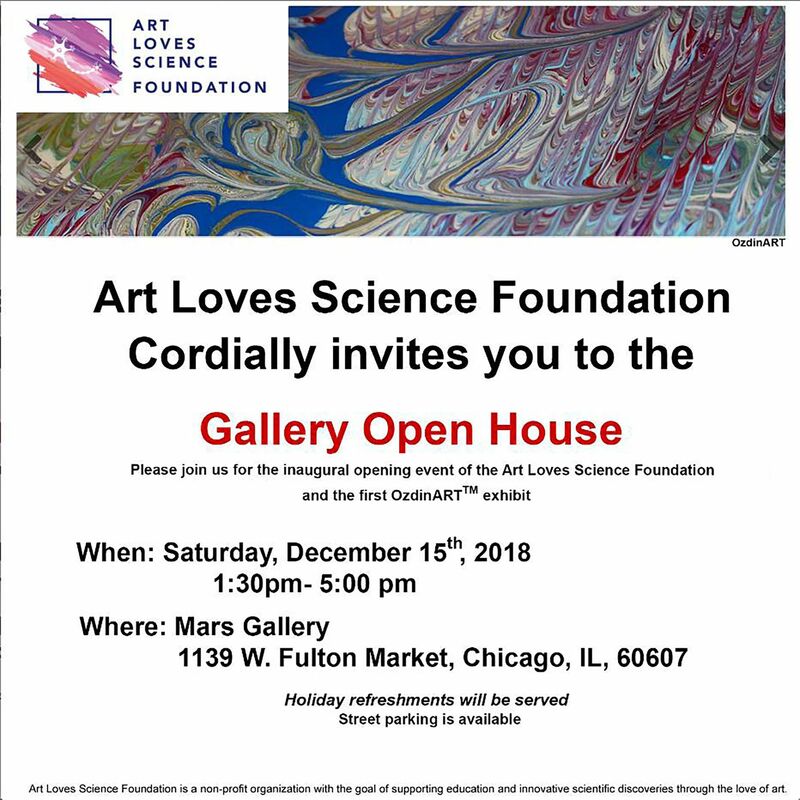 Gallery Open House @ Mars Gallery, December 15, 2018, Saturday 1:30pm - 5:00pm. Art Loves Science Foundation: Connecting art and science for a better future, AB Newswire @ November 13, 2018. Dr. Hande Ozdinler and Dr. Derya Ozyurt Launching ART Loves Science Foundation: Connecting ART and Science for a Better Future, Yahoo Finance @ November 13, 2018. Dr. Hande Ozdinler and Dr. Derya Ozyurt Launching ART Loves Science Foundation: Connecting ART and Science for a Better Future, Newswire @ November 12, 2018. Dr. Hande Ozdinler and Dr. Derya Ozyurt Launching ART Loves Science Foundation: Connecting ART and Science for a Better Future, ePR Newswire @ November 12, 2018. Art Loves Science Foundation: Connecting art and science for a better future, Navva. Dr. Hande Ozdinler and Dr. Derya Ozyurt Launching ART Loves Science Foundation: Connecting ART and Science for a Better Future, PR Newswire @ November 12, 2018. Chicago Woman September October 2018. Appreciating The Importance Of Upper Motor Neurons, Science Trends @ July 12, 2018.